I’ll admit it: I’m crazy. Sitting for hours on end with a tiny makeup brush painting scenes and characters on my eyes, just to wash it off after ten minutes, is my idea of fun. 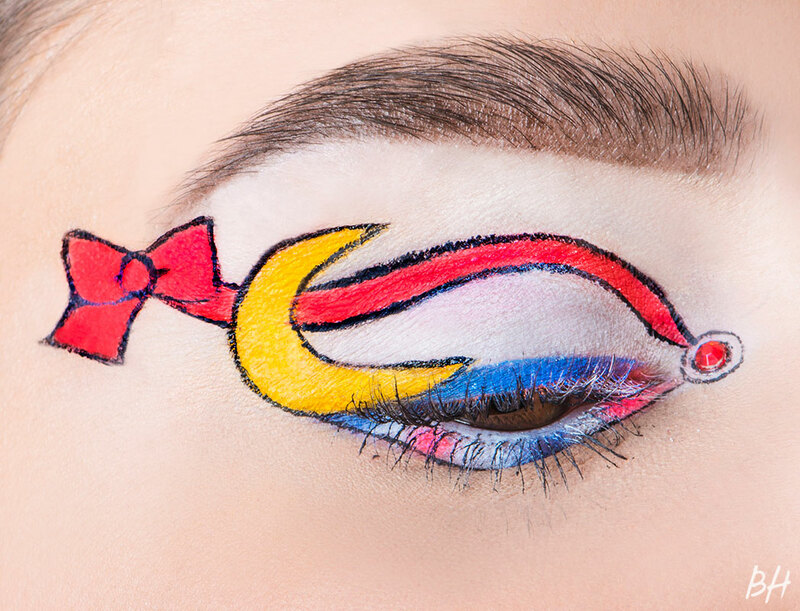 But there’s something that’s just so gratifying about taking makeup, turning it into art, and making people go “wow.” And once the rest of the Beauty High team discovered my odd talent, they thought it would be cool for me to do something fun, bright, and creative to share on the site. After some brainstorming, we thought: “Seriously, what’s more fun than being a kid?” And that’s how this crazy, little story came about. Who doesn’t remember the Care Bears, Lisa Frank, and Strawberry Shortcake? While some of these cartoons and toys are still around, let’s be honest, they’re just not as awesome as the ones from back in the day. For these looks, I either took inspiration from certain aspects of the characters or just recreated them entirely. In any case, if you were a child of the ’80s or the ’90s, these images will for sure make you nostalgic. I know, I know, you’re probably wondering a million things. “How do you do it?” Tiny brushes and a lot of patience. If you’re curious, for all the black outlines, I used a LaCorneille Spotter brush in size 10/0, which you can get at the art store. “How long did it take?” In total, everything took about 14 hours over the course of two days. “Were your eyes sore?” Yes. And stained pink for a day. I don’t want to talk about it. 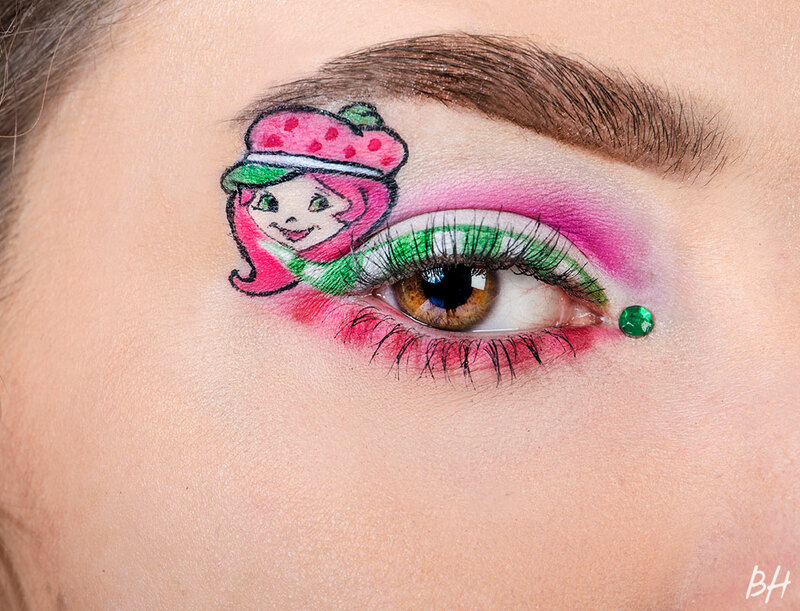 For this look, I took inspiration from Strawberry Shortcake’s green and white striped tights for the winged liner, and from her two-toned pink hat for the lower lash line. I then applied a matte white all over the lid and blended a hot pink shadow into the crease before sketching an outline of her face with liquid liner and filling it in with colored eye shadows. Finally, I finished the look off with a tiny, green rhinestone in the inner corner. Since Lisa Frank had so many different characters, I was mainly inspired by the bright colors that graced the covers of our notebooks and folders in middle school. I used a range of vibrant, matte neon shadows and pigments and applied them liberally all over my eye, paying attention to color placement and making sure they blended together seamlessly. Then, inspired by the signature leopard and zebra prints that appeared so often throughout her works, I took a liquid liner and traced out some leopard spots and zebra stripes on top of the color. I decided to draw three of the main characters–Bugs, Daffy, and Porky–on my lid, which was way harder and more time consuming than I expected. Since I drew them on the mobile part of my lid, an area of the eye that is naturally curved, creating the right proportions and making sure everything looked fine when my eye was closed was really tricky. Getting the eyeliner to go on smoothly was also an issue, since the skin on that part of the eye moves around more and, from blinking and moving your eyes, the product can crack after it’s dry. Basically, I had to do a lot of retracing. I started off by outlining the characters with a black liquid eyeliner and filled in the shapes with a mix of eye shadows. 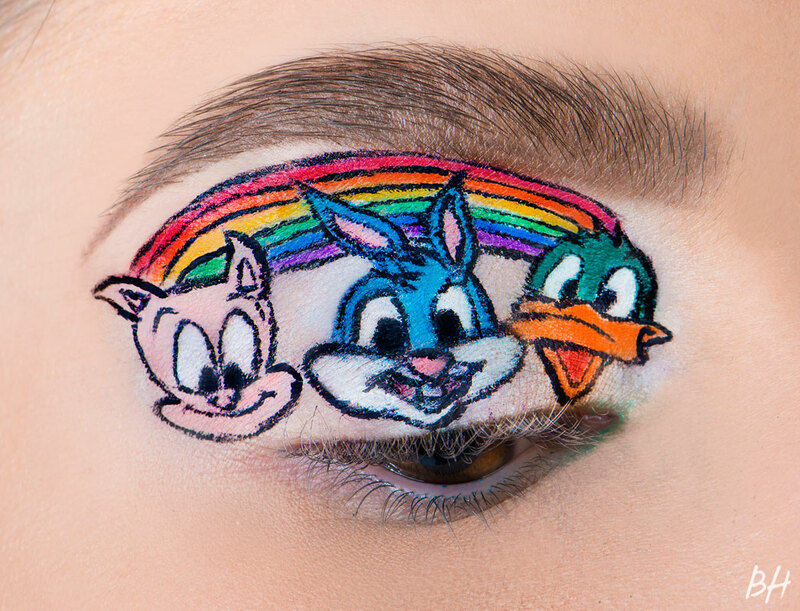 Then I drew a rainbow above them, to represent the one in the Tiny Toons logo, and outlined that with a black liquid liner, as well. 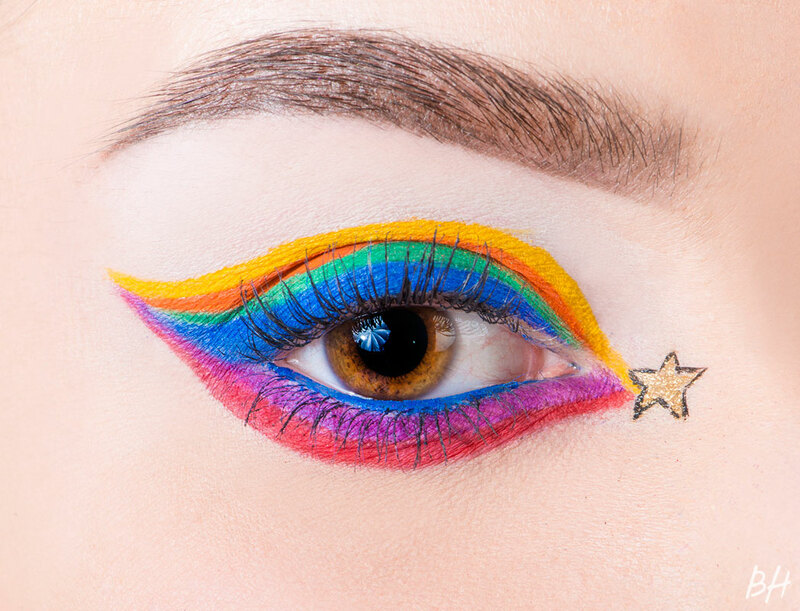 Rather than just simply draw Rainbow Brite on my eye, I was inspired more by (obviously) the bright colors she wore and the stacked cuffs of her sleeves. I wanted to do something that was layered just like that, so I decided on an intense rainbow cat eye, where each color stacked on top of one another. 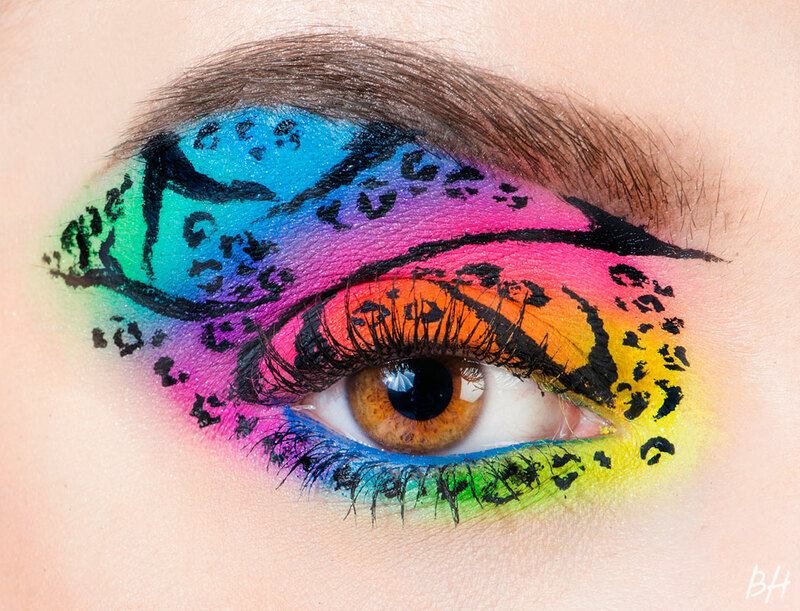 I achieved this by mixing bright, vibrant eye shadows with a mixing medium to create my own custom eyeliner and then tracing out the various wings with fine artist brushes. I made sure all the colors met at a sharp point both on the inner and outer corners. Then, I finished everything off with a tiny, gold star–to represent the stars on her outfit–on the very inner corner. To be honest, I had no idea what Popples were before this. I’m pretty sure they came and went before I was even born, but from what I’ve heard, they were pretty popular. I did some research to determine what seemed to be the most popular Popple, and traced its outline onto the outer corner of my eye. Then, I used a mix of pigments and eye shadows to add color. 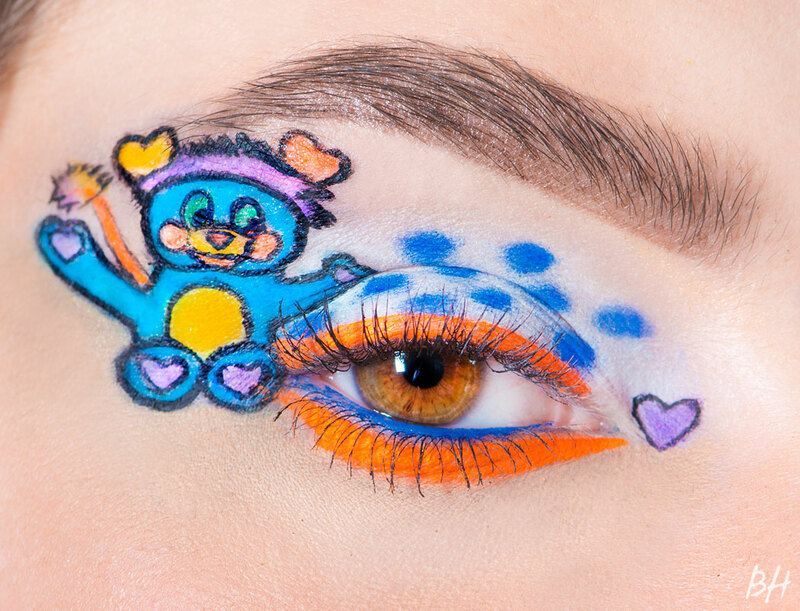 I covered my entire lid in a matte white eyeshadow and added a line of neon orange eyeliner top and bottom, to tie in with the colors of the Popple. Then I added royal blue polka dots all over the lid to represent their tails and the dots in the logo. I finished the look off with a tiny lavender heart on the inner corner to tie in with the hearts on their ears and the soles of their feet. For Sailor Moon, I took a lot of inspiration from her clothing. I first traced the shapes of everything with a white kohl pencil. I started off with (of course) a yellow moon on the outer corner of my eye. Through my crease and past the moon, I created a red ribbon that ended in a bow, which represents the bow on the front of her shirt. I covered the lid in white, added a line of navy liner across the top lash line, and created red, white and blue stripes on the lower lash line to tie in with the colors of her outfit. Finally, I replicated her red and white circular hair pieces on my inner corner and topped it off with a red rhinestone. If you’re like me, you were obsessed with Care Bears when you were younger. I’m pretty sure I owned every stuffed animal and they’re still in a bin somewhere collecting dust. 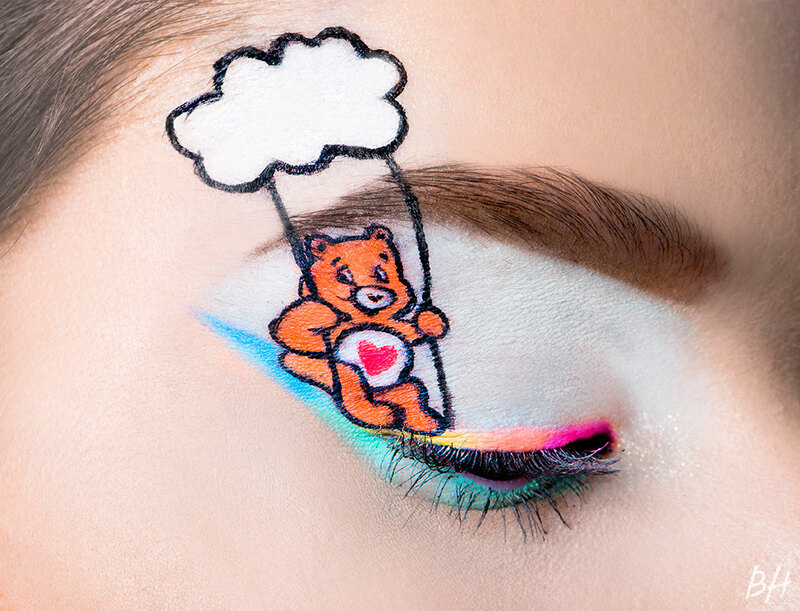 When I think of Care Bears, I have an image in my head of them frolicking through rainbows and clouds, so that’s basically what I translated onto my eye. For the actual Care Bear, I picked Tenderheart bear because I’m pretty sure I remember him kind of being the leader of the pack (And let’s be honest–I was tired at this point and his symbol was the easiest to draw). So, I started by sketching him out with a white eyeliner pencil, tracing that with black liquid eyeliner, and then filling it in with a mix of shadows. Then I took a white cream shadow and drew the rainbow (s)wing (hehe, see what I did there?) that he’s sitting on. I took a variety of pastel eye shadows and patted them on top of the cream liner to create a gradient rainbow. Then, I covered the entire lid in white and swept a pastel green on the lower lash line to connect it back up to the green in the winged liner. Finally, I drew a cute cloud above my eyebrow and sketched two lines as the ropes for the bear to hold on to. 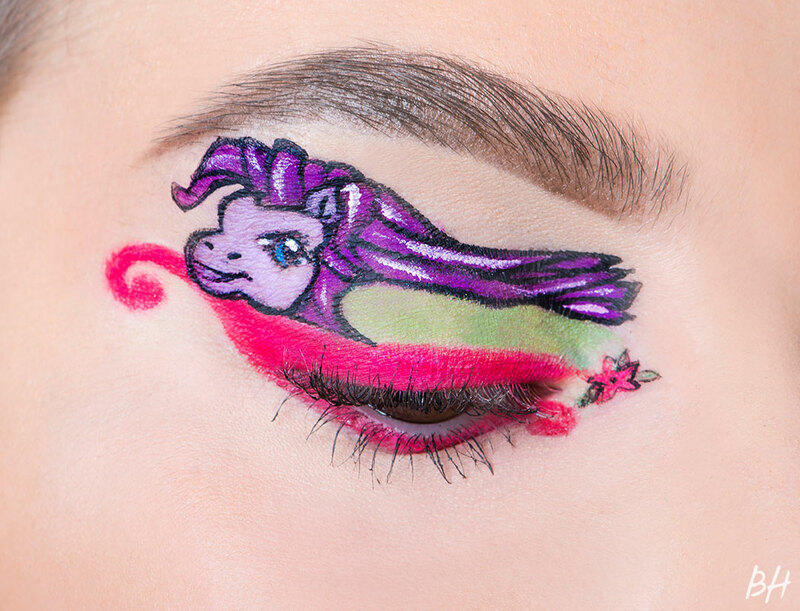 For this look, I drew inspiration from both the old and new versions of My Little Pony. The swirly, hot pink liner plays off the current logo, while I decided to depict an older version of one of the characters. I started, as always, by tracing out the design with a white pencil, and then added outlines and details with a black liquid eyeliner. To fill it in, I mixed eye shadows with a mixing medium, in order to create a custom liquid liner, and painted inside the borders. I also took a white liquid eyeliner to add some highlights to its mane. I filled in the rest of my lid with a spring green color, to represent a grassy field, and finished off the look with a small pink flower on the inner corner.